He is a poet, essayist and translator and writes in English and in his native Russian. Mr. Gritsman is the author of five volumes of poetry in Russian: No Man's Land (Petropol, S.-Petersburg), Double (Hermitage, New York), Transfer (Arion, Moscow) and Island in the Woods from the Pushkin Foundation Publishing House in S.-Petersburg. Book of essay on poetry Poet in Intercultural Space was published in Moscow in 2005. 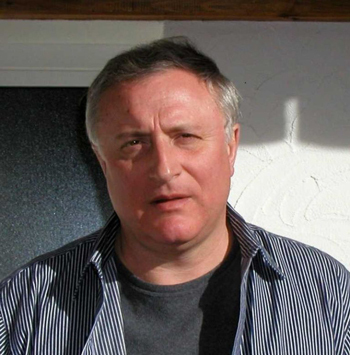 Andrey is the author of many publications in Russia, in Israel and in Europe in prestigious literary periodicals. Bilingual book in English and in Russian View from the Bridge (Poems and Essays) was published by WORD in New York in 1999. New collection Long Fall: Poems, Texts and Essays in English was put out by Spuyten Duyvil Press in New York in 2005.. Poetry collection In Transit in English with Romanian translations was published in 2004 in Bucharest, Romania. Andrey's poetry was translated into several languages. As a translator Mr. Gritsman is focused on translations of modern Russian poetry into English and poetry of the Russian Silver Age: Akhmatova, Mandelstam, Blok. Poems and essays in English have appeared in Richmond Review (London, UK), Ars Interpres (Stockholm-New York), Poetry International, Manhattan Review, New Orleans Review, Bayou, Confrontation, New Press, Poetry New York, Berkshire Review and many others and were anthologized in Modern Poetry in Translation (UK), in Crossing Centuries (New Generation in Russian Poetry) and in The Breath of Parted Lips: Voices from the Robert Frost Place, CavanKerry Press. Andrey's work was nominated for the Pushcart prize twice in 2005 and in 2005 he was shortlisted for the PEN/American Center Joyce Osterweil Poetry Award for 2005. Mr.Gritsman received the Master in Fine Arts degree in Poetry from Vermont College. He runs Intercultural Poetry Series in a popular literary club Cornelia Street Café in New York City and edits an online international poetry magazine INTERPOEZIA. This question is hard to answer because I usually don't write in one special room. Poetry is written anywhere and everywhere: my office at work in the hospital, between cases, telephone calls and such, whenever I am in the mood. The other possibility is when I am traveling, waiting at the airport gate, and especially at medical conferences, particularly when the lights are out and a presentation is in progress. Editing and putting the finishing touches-is a different story. This is usually done on the computer, in my study at home or in my office at work. Nonfiction and some short stories are usually dictated on a microcassette recorder and then submitted for typing. This an important point because naturally I do most of my writing from the voice, so to speak, as a variant of live speech, and not really as written word. Anyway, the room where I work is a regular study with a computer, bookshelves with some necessary literature, dictionaries, etc.-some shelves have materials for the magazine Interpoesia and correspondence-and a beautiful, large window looking out onto the shady street with trees, tree branches looking into the room. Do you write your poetry in Russian first? What is your process? I write my poetry in Russian when I write in Russian. This usually starts with some sound, line, a couple of words, or some fleeting idea. Usually there is an underlying working idea in my head that later takes form of a poem. Depending on the mode and situation and the starting point, poetry in English comes pretty much the same way. I virtually never write in Russian first and then translate and vice versa. These are, if you will, two different poets, sort of virtual Siamese twins. Twins, however, with one soul, which for some strange reason is capable of speaking and telling its own story in two languages. Afterwards, I might translate some of the poems into a different language, but typically these are two separate processes, writing in Russian and English. I think that writing poetry is an autonomous process, not very much related to external life or events. Having said this, however, some event or turn in life's path may trigger a poem, but usually this is mostly an internal process. It is mostly related to the life of a soul, its inner development and its inner workings. Many times a poem could be a remote echo or reflected light from a faraway object, event, or another soul, a person who has been close to me or, sometimes, unfortunately had been close to me. I am always reading several books at the same time: some in bed before I go to sleep, some I listen to while driving my car, some I have on my night table, and I read pieces from these books. Over the last several years I have read a lot of books while driving, and I find this very soothing, calming, and very inspiring. Right now I am reading-listening to-Dead Souls by Nikolai Gogol, a fascinating, brilliant book, which is very connected to today's life in Russia. In terms of mentality, sensibility, and characters, not much has changed since the 19th century. Another interesting book that I am reading is Moscow, 1941 by a British historian: a very interesting history of the city which I am from, Moscow, and the tragedy of the German invasion of 1941. I also have a couple of books by Michel Houellebecq, a brilliant French writer, very controversial, but very interesting to me. I continue looking into a couple of his recent novels and re-reading some pages, such as The Possibility of an Island and 2002's Platform. What is the writing scene like in Russia? I should say that it is unhealthy right now. The censorship is pretty strong now in Russia as it is gradually becoming what is an increasingly totalitarian state again. But it is mostly concerned with TV, newspapers, and mass media. They haven't really touched literature yet, since it does not now have such mass appeal. But there is still governmental, industrial complex influence on literature by virtue of handing out various awards, giving money for publishing books, etc. So there is some unhealthy agitation around various awards, formation of groups, rivalries, etc. But there is really no huge, bigger than life name in prose or in poetry now. The popular writing, such as thrillers, some historical thrillers, etc. is flourishing in Russia, and sales are high. The real prose exists, but again there is no current, modern Russian "Dostoevsky." Poetry is gradually becoming similar to American poetry, which is probably a natural process. I mean that it is becoming more decentralized with a number of various groups, publications, etc. The Internet has tremendous penetration in Russia, in terms of publications and group publications, perhaps even more than in the West. This certainly has changed the face of contemporary literature, because texts become readily available; there are plenty of them, in fact too many on the Internet. A lot of this information is unnecessary and even hazardous. The Russian literary system, however, created an unprecedented Internet portal, called The Reading Room (http://magazines.russ.ru), which combines most of the important, live literary journals and Internet projects. This is published under the umbrella of the so-called Russian Journal, a big project combining already mentioned Reading Room, periodical publications of the literary magazines, current events, announcements, etc. It comprises about 30 to 35 magazines, all on the same Web page, and in most of them virtually the entire contents available for review and printing. We are fortunate that our Russian version of Interpoesia is included into this project. This combines both long-living and well-established magazines such as New World (Novyi Mir), Znamya, Oktyabr, and others, as well as the new, more modern, more Internet-oriented publications like our Interpoesia and some others. There is really no such publication available in English or, as far as I know, French language literature, and this is unfortunate. Can you imagine such an Internet portal combining the New Yorker, Poetry, Georgia Review etc., as well as such wonderful and interesting Internet projects as your Červená Barva Press and our Interpoesia? You are editor of Interpoesia, an on-line literary journal in Russian and in English. When did you start this journal? What type of work do you look for? What are some challenges you face? How many issues come out a year? I started the project Interpoesia (www.interpoesia.net or .com) in 2004. As it usually happens, the situation developed in a different way than I thought it would at the inception of the project. This worked out to be two different, separate magazines, one in Russian and one in English, living their own separate lives. Gradually there is some developing connection between them, in terms of translation of some interviews, discussions, and gradually increasing number of poems translated from Russian into English or from English into Russian. However, the literary cultures are still quite different, and therefore Interpoesia in English became basically an annual Internet publication with a plan to publish periodic anthologies. One such interesting project is called Stranger at Home, Contemporary American Poetry with an Accent. In other words, this will be a large anthology of poets for whom English is not a native language and who live in the U.S. and are published American poets. This call had a very good response, and the portfolio is full of very interesting, fresh poetry from all over the United States from a multicultural and multilingual literary community. This will be published in 2007 on-line as an issue of Interpoesia Internet magazine as well as a published book-Anthology. As I mentioned before, Russian Interpoesia has become one of the leading poetry journals in Russian language and is presented on the main literary site in Moscow, Russia. It now will be published quarterly on-line with an annual Anthology, "The Best of Interpoesia" in Russian, if you will. We are looking for quality poetry, not related to a certain genre, not written by a certain group or by authors living in some geographic area, etc. We are not at all looking for obligatory big names to claim them as our authors. We are looking with great interest at the emerging writers or writers with an interesting bend in their art and/or in their creative biography. We are interested both in poetry and in short prose, mostly prose poetry, as well as poetry related nonfiction, essays, interviews, and such. The main challenge that we face is, first of all, time. As you know, I have another profession. I am a physician and am very busy in the hospital. I have some people who help me, but there is no well-defined editorial office and full-time salaried editorial employees, and such. So this project requires tremendous concentration, focus, and self- determination. I should say that I have no problem finding good writers and quality poetry. Unexpectedly, one of the problems turned out to be lack of a sufficient number of translators, those capable of doing quality translations both from Russian into English and English into Russian. This is especially true of the translation of Russian poetry into English. There are very, very few poets capable of doing this and who would be able to produce quality poetry, not distorted and not rewritten poetry in American English with some weak reflection of what it has been in Russian. You run a poetry reading series at the Cornelia Street Café in NYC. How long have you been doing this? Talk about what this experience has been like for you. The Intercultural Poetry Reading Series at the Cornelia Street Café, a literary club in New York, started more than five years ago. As you might know, there are several cultural poetry series in New York: Italian-American poets, Greek-American poets, and so on. Curiously enough, considering the powerful image of the Russian literary and artistic culture, there was no Russian-American poetry reading series in New York. So about six years ago, I was asked to run one. But in a short period of time, it turned out to be that the reading series had outgrown itself. There were many more interesting international writers in New York being translated and also writing in original English, as well as interesting American poets keen on the cosmopolitan flare of New York. So we started combining them and renamed it into an Intercultural Poetry Series. Now this is a popular venue in New York, and a lot of brilliant writers read there. Recently we also began thinking about adding some music, a combination of poetry and jazz musicians in our series. Gradually it has become the same project as Interpoesia, and one complements another. The most important experience for me in running this Series has been meeting interesting and very gifted people. So I have been blessed to a certain degree to be in the center of this process, the growing intercultural poetry mix in New York. It has become so popular and busy that now we will be running it once a month. I will have a wonderful co-host poet, Laure-Anne Bosselaar. She is a brilliant poet who writes in English. She is Belgian with two native languages, Flemish (Dutch) and French, and she was writing poetry in French. It adds a different dimension to the project. Your newest book, Long Fall: Poems, Texts and Essays (Spuyten Duyvil), came out in 2004. This book is just amazing. Definitely one of my favorites. I especially love the poems Seven Cards, Magritte: Dominion of the Light, and Caedmon's Song. Please talk about this book. This book Long Fall turned out to be a pleasant accident. I had another manuscript in mind that was already lined up and was turned down by a couple of publishing houses. And then, all of a sudden, after some readings together and seeing each other's work, the editor of Spuyten Duyvil, Tod Thilleman, casually invited me to put together a book for his publishing house. As we talked about this, it turned out that it is possible to combine poems with nonfiction and some personal essays. I became fascinated with this idea because I think that it really reflects on the author's sensibility. Those are essays, personal essays and nonfiction, written over the past ten to 12 years, particularly during my years at the MFA program in Vermont College. I did a thesis on the poetry of Paul Celan, Joseph Brodsky, and some others. It is a relatively unusual project in terms of poetry manuscript and nonfiction, and it was important for me as a first book by already a mature author writing for a number of years and of a certain age. I really appreciate your attention and interest to those three poems. They are very dear to me, written in different times, reflecting different approaches to a poem for me. Seven Cards is a mystery, imaginative poem, somewhat impressionistic and, to a certain degree, cryptic. I found there a certain approach, method, if you will, and this is an example of where this system or method carries through and allows one to do a wholesome poem. Magritte: Dominion of the Light is an attempt to do a poem on the visual art theme. As a matter of fact, it is about this particular painting of Magritte. I like Magritte very much and thought how would it be possible to reflect a painting in a poem. It took me quite a while to find the method. And then I realized that the system of repetitive circles, going in three lines, probably reflects the inner energy and enigma of this particular painting. It is an interpretation of the painting and at the same time, in my opinion, not simply the use of language but a sound reflection of the inner rhythm of this painting. It is for the reader to judge if this succeeded, but I am personally very interested in this poem. Caedmon's Song is an older poem. I am a big lover of recorded books, recorded poetry. So when I came to this country, over a few years I had listened to many poetry recordings in English by great American poets and such. So I was so carried away by listening to the poets themselves reading their poetry, such as Robert Frost and Wallace Stevens. This energy that comes from the voice reading the author's lines-it just gives me an incredible feeling, almost the "creeps." So this poem is about that. Obviously there is Robert Frost, and one of my main early mentors in poetry, Amy Clampitt, as well as related to the recordings of Joseph Brodsky, who was alive at that time, and a few others. Andrey, other books you have published include No Man's Land, Double, Transfer, and The Island in the Woods. Talk about these books. All of the books that you mention are published in Russian and reflect my Russian poetry experience. My first book in Russian, No Man's Land, was published in Petersburg, more than ten years ago, and Transfer was published in Moscow in 2003 and is somehow a collection summarizing the experience of about ten to 15 years, including a few longer poems. The Island in the Woods is a collection of more recent poems, the last three to four years. I think that my style and approach have somehow changed. Rather not a style, but perhaps an inner landscape, somehow a different light lights up the landscape. You know, half moon, full moon, etc. One book of yours, A View from the Bridge, is published in English and Russian. Talk about this book. Does the Russian or English lose anything in translation? A View from the Bridge I think is an interesting book as an experiment of publishing poems in parallel, face-to-face onto consecutive pages. Unfortunately the editorial work on this book has some deficiencies, and the production was also not the best. However, there are some interesting examples of what I call parallel poems, written in parallel. Some of my poems are written both in English and in Russian on the same theme or on the same emotion, and some of them are close to mirror images. There were also two poets who translated some of the poems; Jim Kates and Alex Cigale, both well-known poets-translators from Russian. Yes, in general it is customary to think that a poem loses something in translation. However, I believe that in the book A View from the Bridge, it happens rarely. It is because in my own experiences of re-writing a poem in one or another language, it is a newly created poem, rather than directly translated. And I believe that this actually describes the best, a successful experience with translating poetry, therefore recreating a poem in another language with deep feeling of the original emotion and original inspiration of the poem in its original language. In Transit was published in Romania with Romanian translations. Talk about how you feel when you see your work translated into another language. It must be a wonderful feeling to reach across language boundaries and have your poetry read. I feel the literary community needs more translations. What are your thoughts on this? I was very fortunate to receive this generous offer to publish this book in Romania. I found the experience to be fascinating, particularly when I worked with the translator, Doris Sangeorzan, and the book editor, the well-known Romanian poet, Carmen Firan. There were several extremely interesting discussions about the metaphors and translating metaphors and poetic idioms from one culture into another and from one language into another. Some of my work has been translated into French and is being translated into Ukrainian. Not knowing the language, it is hard to judge the quality of translations of your own poetry, but from the reaction of people when I presented this book, and from the sound, I find that this book is very successful. What is especially interesting, what I have noticed, especially in Romanian, is that because of the shared sensibilities, some of the things in your own poetry come through, sometimes better in a different cultural landscape, a different language. I have a feeling from talking to some people who have read my translations in Romania that some of the things came through better and in a more interesting way just because of the better understanding of my sensibility by some Romanian writers than sometimes here by American writers. I do feel that the literary community needs more translations; however, I would very much caution against spitting out mass productions of translations because they give the reader or literary community nothing but a vague knowledge of the name and topics of the writer in a different language. Translations should be very measured, quality-oriented, and it is an absolute necessity for the translator be as serious and gifted a poet him or herself. The person may know a language brilliantly and deeply, with all of the idioms and knowledge of the culture, however may be lacking at poetic intuition. Such a person would never understand deep enough the metaphor of a gifted poet in another language. So, in my opinion this is really a prerequisite for successful translations so that the translator would be a significant poet him/herself. Besides what I have already talked about, a magazine, reading series, I am working on two or three manuscripts simultaneously. I have a book offer from a friend of mine, an American fiction writer and a poet, Yanina Gotsulska, who runs Numina Press in California. We are going to be doing a more eclectic or esoteric book of shorter poems, more philosophical poetry, if you will. I am also working now on the completion of a larger manuscript called Family Chronicles. This is a series, a kind of memoir, poems about my childhood and family in Russia with some poems also written at various times over the years related to family topics, tied together by "footnotes" written in the form of the prose poetry. So this is sort of the manuscript of the poetic memoir. Some of the literary friends that I have talked about mentioned to me that it sounds like a new genre, and I am very interested in putting this manuscript together. And I have a bunch of poems written through the years which were published in many good magazines over the last two or three years. That actually comprises a third manuscript that I would like to do. So the only problem is the time to do all this, and since I seem to be moving a lot over the last number of years, it is also a problem of space. So I am changing "space all the time," probably chasing my own tail, which poets do with themselves all the time anyway.